Home Apple iPhone Why Can’t I Open My Flashlight Without Unlocking My iPhone? Why Can’t I Open My Flashlight Without Unlocking My iPhone? The flashlight feature on a smartphone is surprisingly useful. There are a lot of potential situations where a flashlight can come in handy and you might not have one around. But thanks to the camera flash on your iPhone, and smartphone manufacturers’ ability to realize its potential usefulness, you can illuminate that flash and turn your iPhone into a bright light. But if you have seen other people activate that flashlight without even unlocking your screen, and you find that you are unable to do so, you might be trying to figure out what you need to do. Our guide below will point you to the setting that enables this functionality so that you too can take advantage of this quick access to the iPhone’s flashlight. The steps in this article were performed on an iPhone 7 Plus in iOS 10.3.2. 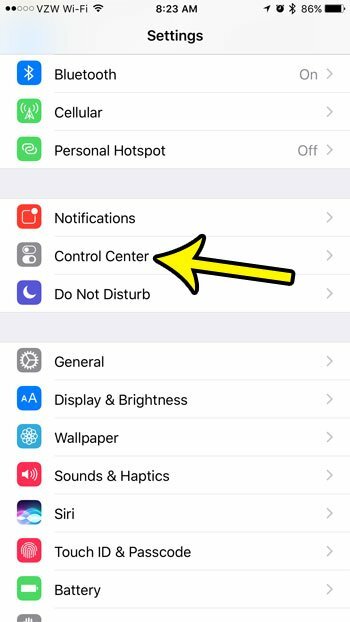 The result of completing this guide is that you will have enabled access to the Control Center from your iPhone’s lock screen. This not only allows you to use the flashlight without unlocking the iPhone, it also provides a quick way to turn on Airplane Mode, adjust the screen brightness, toggle Wi-Fi and Bluetooth, and more. The Control Center is very useful, especially when you can use it without unlocking the device. Step 1: Touch the Settings icon. Step 2: Select the Control Center option. Step 3: Tap the button to the right of Access on Lock Screen to enable it. There should be green shading around the button when the option is turned on. It is turned on in the picture below. Now you can press the Power button on the side of the phone to lock the screen, then press the button again to illuminate the screen. 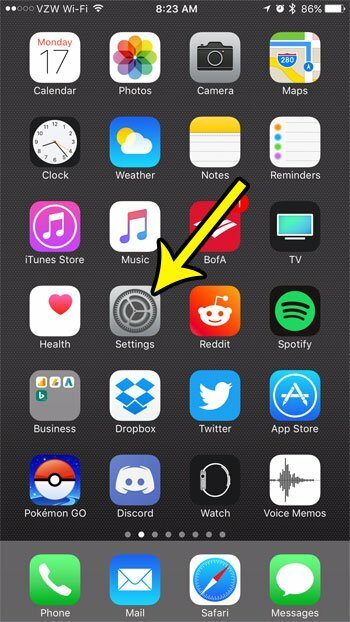 Swipe up from the bottom of the screen, and you should be able to tap the flashlight button to turn it on. Do you find that you are often opening your iPhone wallet unintentionally? 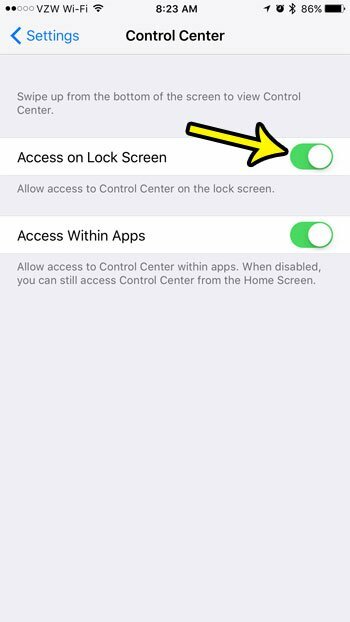 If you don’t really need the wallet on the lock screen, then this article will show you how to disable that option.